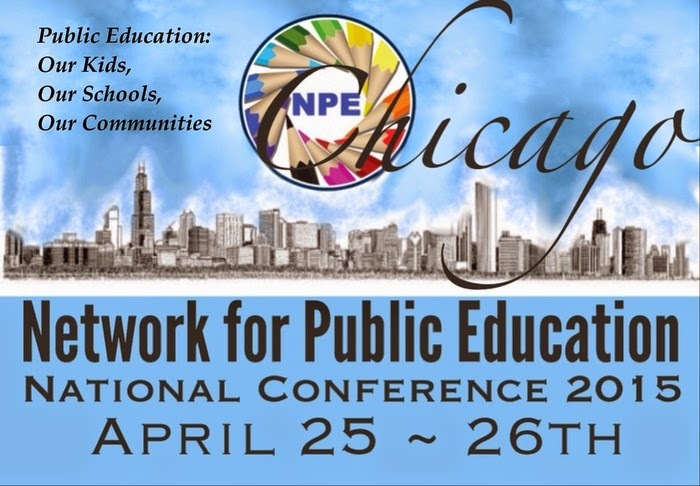 Chicago, Illinois is ground zero in the fight against corporate education reform this weekend as the Network for Public Education (NPE) held its 2nd annual conference at the Drake Hotel. It was an exciting day filled with information, exhiliration and emotion as almost 600 passionate teachers, teacher leaders, political activists, parents and education bloggers packed the house. For those who were unable to make it to Chicago the event was livestreamed at schoolhouselive.org. You can catch day two there tomorrow. Here are the highlights from the sessions I was able to attend today. New Jersey’s own Tanasia Brown of the Newark Student Union showed off the skills of a veteran speaker as she got the day off to a rousing, not to mention, chanting start. Her message: “Victory means seeing my brother being able to attend a real public school in Newark. Tanasia was followed by the always inspirational Jitu Brown of Chicago. Jitu urged us to stop describing corporate education interlopers “reformers” and start calling them what they are “colonizers.” Powerful stuff. Jeff Bryant of the Education Opportunity Network moderated this panel of media communication experts Hilary Tone and Diallo Brooks. Tone cited the recent study her group did that showed when news outlets do stories about education, they rarely talk to educators. Brooks encouraged teachers to tell their stories. Stories carry the messages better than facts do, because people are not persuaded by facts. Reformers are telling a simple false story of failing schools and bad teachers. We must combat this false narrative with our own stories and we must keep telling them. Lunch, of course, is always a highlight for me, but today’s lunch was made particularly memorable for the opportunity to listen to bloggers Jennifer Berkshire (Edushyster) Peter Greene (Curmudgucation) and Jose Vilson (Thejosevilson.com). I if you haven’t sampled the witty writing of these three champions of public education, I suggest you click on these links and get started. Truly a wonderful day. Looking forward to tomorrow’s sessions, including Diane Ravitch’s “conversation” with the AFT’s Randi Weingarten and the NEA’s Lily Eskelsen Garcia. Fireworks anyone? Livestream if you cannot be here.